Warfare History Network » The Battle at Northallerton: Knights on Foot? HomeDailyMilitary HistoryThe Battle at Northallerton: Knights on Foot? At Northallerton, the descendents of the Norman knights who fought at the Battle of Hastings opted to dismount and fight on foot. Find out why below. Less than 75 years before the battle at Northallerton, at Hastings on October 14, 1066, the mounted Norman knights had charged time and again, battering themselves against the Saxon shieldwall, finally breaking it by use of archery and coordinated attacks. At Northallerton, the descendents of those Norman knights opted to dismount and fight on foot. Why Dismount And Fight on Foot? This surprising switch from mounted knight charges to dismounted static defense at first may seem to be a devolution in military tactics. Why would the Anglo-Norman knights refrain from fighting on horseback, giving up their mobility and battlefield shock assault advantage over their enemies? The question is intriguing considering the Norman knight had proven his worth time after time on the battlefields of France, Italy, Sicily, and even mainland Greece. Before the Battle of the Standard, this phenomenon of dismounting cavalry to fight on foot was certainly not new. The battle of Taginae in 552 ad is a striking example of dismounted cavalry defeating a mounted enemy. The Byzantine general Narses dismounted over 9,000 of his “allied” Lombard and Herul cavalry, giving the enemy Gothic general Totila a tempting target against which to concentrate his mounted charges. When the Goths charged, Narses’ thousands of archers simply flanked the masses of enemy cavalry and mowed them down as they rode into the ambush. Thirty years before Northallerton, at Tinchebrai, an Anglo-Norman army under Henry I, involved in a siege on the continent, dismounted 1,400 of his knights and retainers, tempting his enemy, Robert Curthose, to order a mounted charge against them. The close-order foot held against the cavalry, as the Saxons did most of the day at Hastings, and Henry then signaled his own mounted knights, in ambush, to charge into Curthose’s flanks, subsequently winning the battle. Fighting in the north of England, were the Anglo-Normans attempting to emulate the Byzantines or King Henry’s tactics? There was no “ambush” involved, and those few Anglo-Normans who did remain mounted were to the rear of the army, not hidden to the flanks. Archers, however, were there in large numbers. Tempting the Scots to attack, as they were expected to do, the Anglo-Norman commander, William de Aumale, and his fellow nobles, prelates, and advisers most likely seized upon the opportunity to use their massed firepower against an enemy who wore no protective armor. Dismounting the knights would provide the Scots with a tempting, static target at which to throw themselves … and be cut to pieces as they did so. There was one more compelling reason to dismount the knights. The masses of foot that flocked to the banners of the Anglo-Normans were not of high regard. Most were militia fyrd, holdovers from the Saxon levy en masse of the last century. They would muster to protect their homes and local territory, but were unarmored and randomly trained. The problem with using such troops was that they had a tendency to get excited and could easily be overcome with elation one moment, breaking their ranks and charging from prepared positions, only to be panicked and run away the next. Such instability had been countered in the days of Saxon rule by use of ranks of veteran, armored huscarls in their front ranks. These heavy infantry huscarls had been the steady bodygard foot on whom the Anglo-Saxon kings and earls had depended for decades. They were virtually destroyed at the Battle of Hastings in 1066. The Anglo-Normans obviously knew of the instability of their numerous militia, so emulated their old enemies and provided a front rank of veteran, armored fighters as well. Only these were dismounted knights because the Normans had no veteran foot units akin to the huscarls. What did the Anglo-Normans plan to do? Did they actually expect the Scottish army to batter themselves against a phalanx of close-order armored spearmen, backed by large numbers of archers? The answer is yes. The Anglo-Norman generals knew their opponents very well; they had been at war with them for years. There was no question that the Scots would attack, but could their own army hold in the face of that attack? Here is where a third piece of the tactical puzzle comes in. Even when inspired by fighting for hearth and home, irregular militia would still lose heart very quickly if a battle took a turn for the worse. At Fulford Gate in 1066, before the Battle of Stamford Bridge and Hastings, the Northumbrian and Mercian Saxon fyrd had attempted to stymie the Norwegian invasion of northern England. Led by their earls and fronted by hundreds of huscarls, the Saxons had actually acquitted themselves very well until Harald Hardrada’s Norse battle fury proved too strong—the militia caved in and fled. So at Northallerton the Anglo-Normans provided a further boost to their fragile morale. A carrachio or wagon was outfitted with masts from which were hung religious banners. These gave the militia a rallying point and focus. So long as the banners were flying, they were not defeated. Fighting for self-preservation, loved ones at home, as well as God against the “heathen” Scots gave the militia added fortitude to balance out their overall trepidation and fear of battle. The Scots were a totally different story. King David had a very strong but disparate army at his disposal. There were hundreds of mounted knights, Scot and mercenary as well as disaffected rebel Anglo-Normans. The Scots army contained a small number of archers as well as various contingents of highland clansmen. There were thousands of spearmen, unarmored, but sturdy and tough when fighting in their close-order ranks. 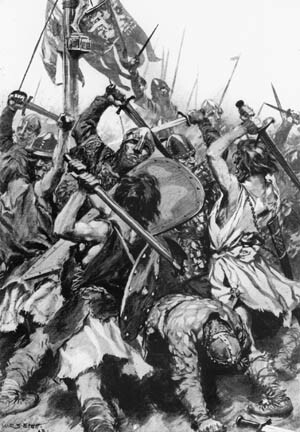 There were also large numbers of ill-disciplined Galwegians in their tribal warbands. These troops traditionally fought under their local leaders or regional chieftains and owed only nominal allegiance to the king. They also had a very high initial enthusiasm for fighting. David’s battle plan involved a Hastings-style tactical battle by which his limited number of archers would attempt to shoot gaps in the packed ranks of the Anglo-Normans and then the heavy cavalry would ride into the gaps followed by the clansmen and spearmen. Once the Anglo-Norman formations were broken, the Scottish king knew that the fyrd militia would panic, turn tail, and run. The Scottish tactics had merit and were based upon general assumptions from the recent past. The problem was that the Galwegian chieftains refused to follow orders, demanding their right to lead the attack. Their inflexibility and insistence forced David to change his plans to avoid bloodshed within his own ranks which would have destroyed the fragile coalition holding the Scottish army together. By allowing the Galwegians their honorable place at the forefront of the attack, David had to figure that it would do little harm, letting the Anglo-Normans exhaust themselves fighting the frenzied warbands before shooting at them and then charging in with the heavy cavalry. The major fault with this assumption was that it was predicated on the fact that the Galwegians would make a concerted, supported attack on the Anglo-Norman phalanx. This proved to be far from the reality of the moment —the warbands attacked piecemeal allowing the Anglo-Norman archers to concentrate fire on the individual attacking groups. The wild attacks managed by sheer force of impact to force the enemy back, but being uncoordinated and unsupported, they fell apart. When the Scottish and allied heavy cavalry finally did charge, their attack broke through the enemy ranks, but it was too little too late. The rest of the army was either demoralized, in retreat, or already destroyed and there were no reserves to exploit the breakthrough. If the original plan could have been adhered to, the battle might have had a very different outcome. As a result of the Battle of the Standard, military minds in England grasped the essential tactical value of the formations of archers and dismounted men-at-arms, holding their positions and shooting their opponents into disorder. The various wars of the next three centuries with Wales, Scotland, and France found the English armies further honing their tactics up to and including the time the famed longbow provided the death knell of the mounted nobles of France on the battlefields of Crécy, Poitiers, and Agincourt. Tags Anglo-Norman, Battle of Hastings, Battle of the Standard, King David, King Henry, knights, Longbow, Militia, Northallerton, Saxon.